Class up that tuxedo with the help of Star Wars and these excellent Star Wars Darth Vader TIE Fighter Blueprint Cufflinks! Darth Vader would've worn these if his TIE Fighter ever needed some impromptu repairs, and if they're good enough for the most powerful Sith Lord that the Empire had ever seen, then they're good enough for you. The blueprints of Darth Vader's TIE Fighter would look great on your suit! 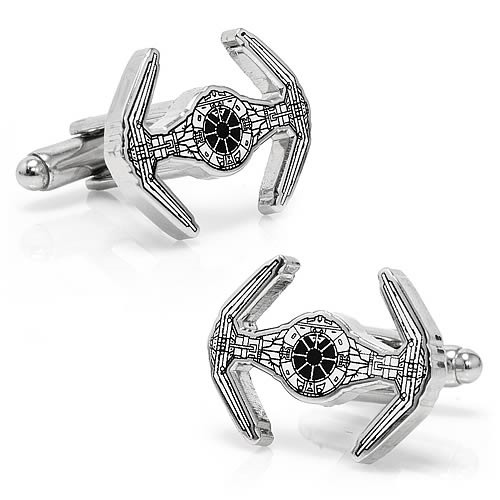 You can really flaunt your fandom when you wear these excellent Star Wars Darth Vader TIE Fighter Blueprint Cufflinks. Measures about 7/8-inches wide.